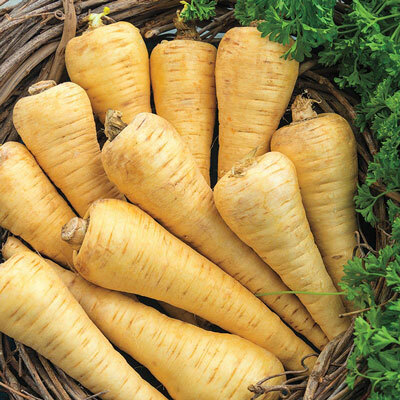 All-American Parsnip | Henry Field's Seed & Nursery Co.
Creamy, wedge-shaped roots 3 in. across, 10-12 in. long. Extra-sweet flavor and fine texture, uniform in size. Dig in fall for storage or leave in the ground till spring. 105 DAYS. For each offer ordered, get approx 300 seeds per packet. Depth: 1/2 -- 3/4 inches. Days To Maturity: 105 days. Soil Requirements: Deep, light, rich, stone-free soil. Loose soil is important for well-formed roots. Seed Count: Approximately 300 seeds per packet, 1 oz. is approximately 7,000 seeds. Size: 10 - 12 inches long X 3 inches diameter. Fruit: Smooth, slender, tapering roots. Sweet, fine-grained. Hollow crowned, white skin and white flesh.